Founded in the year 1957 under parent company Aerolíneas Argentinas with company headquarters located at Buenos Aires, Argentina, Austral Lineas Aereas is an Argentina domestic airline company operating from its main base at Aeroparque Jorge Newbery. With a fleet of 33 aircraft, Austral Lineas Aereas flies to 22 cities from its main hub at Aeroparque Jorge Newbery. 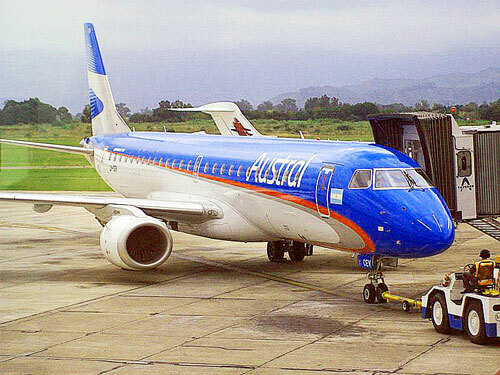 Austral Airline's frequent flyer program is known as Aerolíneas Plus and it's airport lounge is known as VIP Lounge. The airline is also an affiliate member of the SkyTeam alliance network. You may wish to check Austral Lineas Aereas flight schedule, baggage allowance, reviews or contact information from Austral Lineas Aereas website or to make a flight booking.